It's good fun, i like getting that big roller thing and running around with it. There are a lot of moves i cant seem to do yet though. Having a lot of connection errors now. Going to try handheld mode now. I didn't have much time in tutorial mode, got put straight in a match really. Seems a lot slower than i remember? B to run seems slow. Solid fun though. As a longer first impression, the maps are too small. 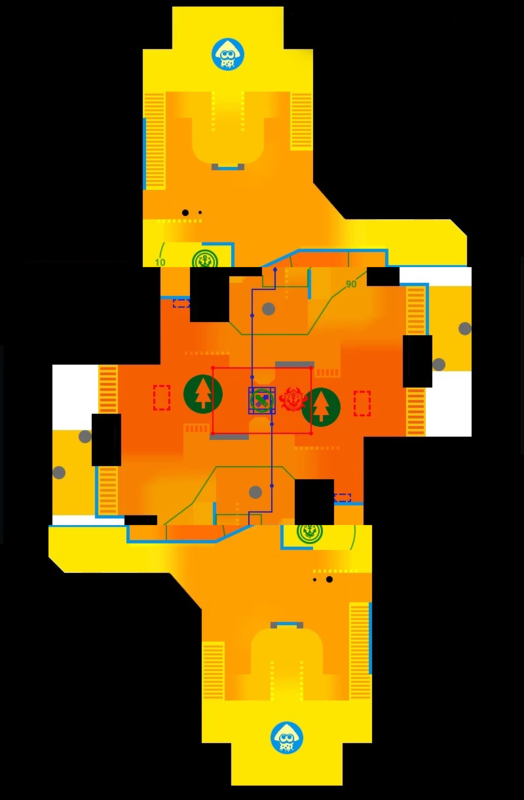 They both seem about 2/3 of the size and as a result there doesn't really feel like a mid to the maps, they're just a big central space and two spawns. I dunno, i can spend a fair whck of the with the roller not meeting anyone. This is my first time playing though. Can't get a game anymore. That's exactly what I mean - I know you can recentre using Y but I want to use the sticks to get 90% there and then motion to really zone in as it seems responsive enough. Hopefully that makes sense, it's how I've done it in other games with gyro aiming. The distance from the spawns to the middle of the map, at least on these two maps is considerably shorter. In the first game there was another area each side of the "middle" of about equal size, then the spawn exit routes. This feels like it's just spawn exit routes then mid straight away. It's taking away from the usefulness of the squid jump since it's hard to do it safely, and matches turn into spawn killing quite quickly so far. Could just be these two maps though. Had quite a few disconnects, but it is a stress test. The only complaint I have about that is being unable to quit matchmaking while sitting waiting for player(s) - unless I missed something. Loved remixing the tunes while waiting for a game. When I play again tomorrow I will need to adjust the sensitivity of the sticks as I was over aiming everywhere. Played about 8 games and I like what I see. Didnt have any disconnects on a wired setup. Maps will no doubt be tweaked and I'll need to play around with the sensitivity controls. I had some trouble with handheld mode and I felt I had to hold the Switch very flat which was a little awkward. Good to see its a lot easier to jump as it always felt super awkward on the Wii U gamepad. I keep opening the map instead of jumping. First time I've tried it but I can see the appeal, Motion controls can be turned of though I'd imagine ? Only had two matches and didn't really check any options. What times today's test fire? Motion can be turned off but I don't recommend it, the vast majority of high rank players in the first game all used motion controls. Stick with the motion controls. I turned it off originally and just used the sticks but when you keep at it they really click. Is it still the squid jump minigame in between rounds? Did anyone try playing with a joycon in each hand? Forgot to try to see if it works. @Duffking Damn !! It wasn't bad I just assumed it was a gimmick. I will stick with it. @INSOMANiAC 3am 11am 7pm. I'm almost certain that's the schedule for the weekend, But somebody might correct me. Seeing a few other people who also think the maps were a bit small. Hopefully it's just these two though. Felt a lot harder to actually squid jump safely and spawnkilling happened quite quickly in a lot of my games. That's true but at some point, probably fairly soon, you won't be able to play the original Splatoon online. It's how it goes with shooters and online sports games. I anticipate putting in 100s of hours so I'm ok with £60 (or more likely £45ish online). I appreciate that a lot of people would be happier spending the money on something else. I didn't really have a sense of the maps (should have taken screen captures) but agree they felt smaller and in three of my matches we spawn camped the opposition quite quickly. The other games were very even. I'm sure no one really knew what they were doing tbh. The one with the climbing walls did have a lot of hiding places and crates in it though. I really enjoyed some of the very small maps in the first game. Having maps of varying sizes led to a lot of different play styles so I'm sure we'll see the same variety in the sequel. Also, iirc they drastically modified at least two of the maps in the orginal game. So it's very likely they tinker with things as the game goes along. My very first time playing Splatoon. Seems good, but not sure if this game would get tired too soon. I take it the full game has extra gameplay modes and a level up system. I lost count how many times I lost connection why playing this in the hour, not sure if the fault was at my end or theirs. 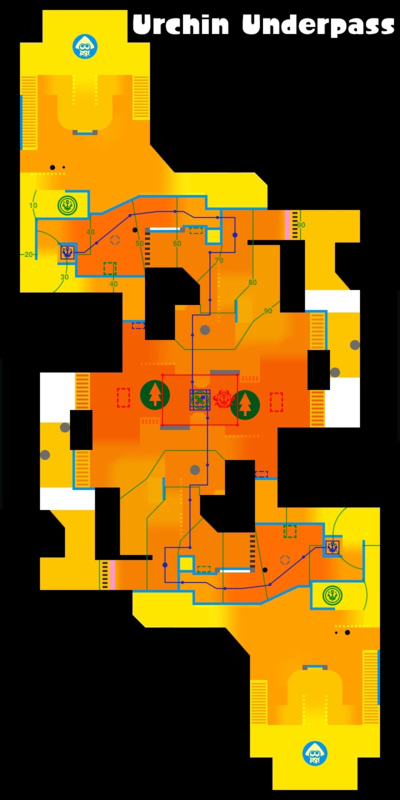 Dirty edit of a map with a similar layout to one of the two in this demo. Here's Urchin Underpass normally. If you take out a big chunk of each team's base then line it up again, you basically get the size of these ones. Just eyeballing it, it seems a fairly close match for the size of the other maps from memory of the overhead view of the new ones. Especially with the shorter distance to mid. We'll see how it feels after the weekend! I have a pretty slow broadband connection at peak times at the moment (approx 2Mb), but in the 40 mins I played it ran flawlessly from one game to the next. I got a surprise day off work! 1 hour before I jump in to my first game. Looking forward to trying all 4 controller options. I've got a Pro Controller, but i'm hoping the lighter Joy Con/Grip combo will be the way forward. Yesterday I was on for the whole hour, started about 10 games and got to the end of about 4 without everyone being kicked out (same names in the next game). I'll let it off as it is a stress test, but if it wasn't I'd be a little concerned. All the other online games I own are fine so it's not a universal issue with my connection. Hopefully next test will be better. @Rewsan Haha, yeah. I got a little confused with CET/GMT timings and jumped online before clarifying the time difference. I was also unsure whether or not the clocks had gone forward yet (not until tomorrow! ).